Bill Goodwin began his professional career at the age of seventeen with saxophonist Charles Lloyd. During the 1960s, he worked with Mike Melvoin, Art Pepper, Paul Horn, Frank Rosolino, Bud Shank, George Shearing, and Gabor Szabo. Joining the performing ensemble of vibraphonist Gary Burton brought him to the East Coast in 1969. After three years with Burton, Goodwin settled in the Pocono Mountains and worked in hotels and resorts. In 1974, he became a founding member of the Phil Woods Quartet. He worked with Woods for forty years as a drummer and record producer, winning three Grammy Awards. 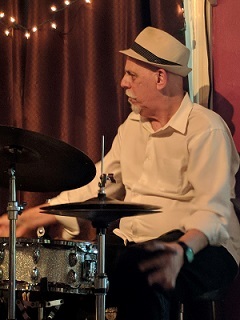 He has performed with Bill Evans, Dexter Gordon, Jim Hall, Bobby Hutcherson, June Christy, Joe Williams, Tony Bennett, Mose Allison, and The Manhattan Transfer. He has been a featured performer at the W. C. Handy Music Festival for many years, serving as a member of the W. C. Handy Jazz All-Stars with guitarist Mundell Lowe, guitarist Tom Wolfe, pianist and vocalist Johnny O’Neal, pianist and vocalist Ray Reach, and drummer Chuck Redd. He was featured on Tom Waits’s 1975 album Nighthawks at the Diner and played talking drum on the song “Crown of Creation” by Jefferson Airplane. Beginning in 2000, he taught at William Paterson University in New Jersey.